Toll-like receptor (TLR) family acts as pattern recognition receptors for pathogen-specific molecular patterns. We previously showed that TLR2 recognizes Gram-positive bacterial components whereas TLR4 recognizes LPS, a component of Gram-negative bacteria. MyD88 is shown to be an adaptor molecule essential for TLR family signaling. To investigate the role of TLR family in host defense against Gram-positive bacteria, we infected TLR2- and MyD88-deficient mice with Staphylococcus aureus. Both TLR2- and MyD88-deficient mice were highly susceptible to S. aureus infection, with more enhanced susceptibility in MyD88-deficient mice. Peritoneal macrophages from MyD88-deficient mice did not produce any detectable levels of cytokines in response to S. aureus. 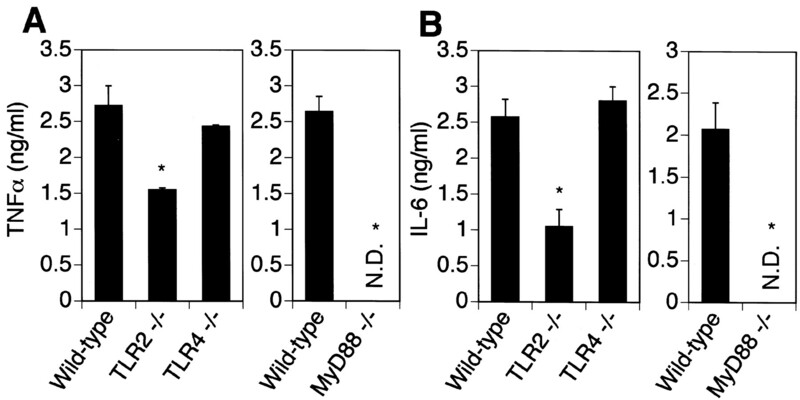 In contrast, TLR2-deficient macrophages produced reduced, but significant, levels of the cytokines, and TLR4-deficient macrophages produced the same amounts as wild-type cells, indicating that S. aureus is recognized not only by TLR2, but also by other TLR family members except for TLR4. A bacterial infection is one of the major causes of death even in the present day. Streptococcus aureus, a Gram-positive extracellular growing bacteria, is a major source of mortality in medical facilities (1). It causes a wide range of infections from skin infection to life-threatening diseases including abscesses of various organs, pneumonia, osteomyelitis, endocarditis, arthritis, and sepsis. Initial host defense against bacterial infection is executed by innate immunity, characterized by the use of germline-encoded receptors for pathogen recognition (2). In Drosophila, Toll family plays a key role in antifungal and antibacterial host defense (3). Recently, mammalian homologues of Toll, designated as Toll-like receptors (TLRs),3 were discovered (4, 5, 6). Each TLR is a type I transmembrane receptor possessing an extracellular leucine-rich repeat and a cytoplasmic Toll/IL-1 receptor homology domain. They are expected to act as pattern recognition receptors, which distinguish pathogen-associated molecular patterns, such as LPS, peptidoglycan (PGN), and lipoprotein (2). Among TLR family members, both TLR2 and TLR4 have been shown to recognize bacterial components. A mutation in the Tlr4 gene is responsible for the phenotype of the C3H/HeJ mouse strain, which is unresponsiveness to LPS, a component of the outer membrane of Gram-negative bacteria (7). Targeted disruption of the Tlr4 gene resulted in abrogation of responses to LPS and lipoteichoic acid (8, 9). In contrast, TLR2 is implicated in the recognition of Gram-positive bacterial components, bacterial lipoproteins, and zymosan (10, 11, 12, 13, 14, 15). TLR2-deficient mice displayed impaired cytokine production in response to Staphylococcus aureus PGN preparation and mycoplasmal lipopeptide (9, 16). MyD88 is a cytoplasmic adaptor molecule essential for the signaling of IL-1R/TLR family. Ligand binding to IL-1R/TLR family results in the recruitment of MyD88 to Toll/IL-1 receptor domains of receptors, which bridges the signal to IL-1R-associated kinase. Ultimately, the activation of a transcription factor NF-κB occurs and permits the transactivation of proinflammatory cytokine genes (17, 18). We have generated MyD88-deficient mice and shown that MyD88 is essential for cellular responses to IL-1, IL-18, and many bacterial cell wall components such as LPS, PGN, and lipopeptide (19, 20, 21). C3H/HeJ mice are known to be highly sensitive to infection with Gram-negative bacteria, owing to the failure of LPS recognition (22). Although TLR2 participates in the recognition of Gram-positive bacteria, a substantial role of TLR2 in host defense against Gram-positive bacteria was still unclear. In the present study, we investigated the role of TLR2 and MyD88 in S. aureus infection using mutant mice deficient in these molecules. The mutant mouse (F2 interbred from 129/Ola × C57BL/6) strains deficient in TLR2, TLR4, or MyD88 were generated by gene targeting as described previously (8, 9, 19). MyD88-deficient mice were backcrossed eight times with C57BL/6 mice. For S. aureus infection, groups of TLR2-deficient mice and wild-type littermates or MyD88-deficient mice (C57BL/6 background) and wild-type littermates were used. Age-matched groups of wild-type, TLR2-, TLR4-, and MyD88-deficient mice were used for the other experiment. S. aureus 834 strain (gift from A. Nakane, Hirosaki University, Japan) was classified as coagulase type II, produced toxic shock syndrome toxin I and methicillin resistant (23), and it was prepared as described previously (23, 24). In brief, bacteria were cultured on trypticase soy agar (Becton Dickinson, Sparks, MD), inoculated with trypticase soy broth, and incubated for 15 h at 37°C. The bacteria were collected and resuspended by PBS. The concentration of resuspended cells was adjusted spectrophotometrically at 550 nm. Mice were given i.v. injections of 0.2 ml of bacterial solution containing 1 × 107 CFU of viable S. aureus and their survival was monitored for up to 14 days. S. aureus suspension (1 × 109 CFU/ml in PBS) was boiled for 30 min and used as heat-killed S. aureus. Mice were given 1 × 107 CFU or 1 × 106 CFU of S. aureus as an i.v. infection, and they were killed 1, 2, or 5 days later. Spleens and kidneys were dissected, homogenized, and diluted in 10-fold steps in sterile water containing 0.5% Triton X-100 (Nacalai Tesque, Kyoto, Japan). Blood was also diluted in water containing 0.5% Triton X-100. Bacterial CFU was determined by plating each dilution on trypticase soy agar and was cultured for 24 h at 37°C. Mice were i.p. injected with 2 ml of 4% thioglycolate (Difco, Detroit, MI). Three days later, peritoneal exudate cells were isolated from the peritoneal cavity by washing with ice-cold HBSS (Life Technologies, Rockville, MD). Cells were cultured for 2 h and washed with HBSS to remove nonadherent cells. Adherent monolayer cells were used as peritoneal macrophages. Peritoneal macrophages (5 × 105/ml) were cultured in RPMI 1640 medium (Nacalai Tesque) supplemented with 10% FCS and stimulated with 1 × 107 CFU/ml of heat-killed S. aureus for 24 h. Concentration of TNF-α in culture supernatant was determined by ELISA (Genzyme Techne, Minneapolis, MN) and IL-6 concentration was also measured by ELISA (Endogen, Boston, MA). Kaplan-Meier plots were conducted and the log rank test was used to test the differences in the survival between wild-type and TLR2-deficient or MyD88-deificient mice. The significances of the difference between the groups in the numbers of bacteria and cytokine concentrations were tested using Mann-Whitney U test. We have previously shown that TLR2 is required for the recognition of PGN from S. aureus. Moreover, TLR2-deficient macrophages did not produce TNF-α in response to cell wall preparation from S. aureus (9). To evaluate the in vivo role of TLR2 against S. aureus infection, wild-type and TLR2-deficient mice were infected i.v. with 1 × 107 CFU of S. aureus and their survival was monitored. As shown in Fig. 1⇓, all wild-type mice survived for 8 days after S. aureus inoculation and 60% survived on day 14. In contrast, about 80% of TLR2-deficient mice succumbed to S. aureus and died within 8 days, and only 10% survived on day 14 (p < 0.03). 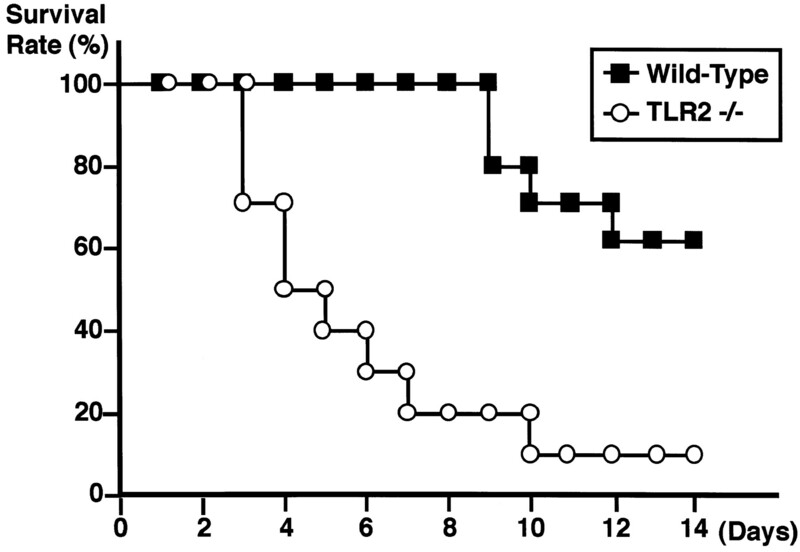 However, when a low dose (1 × 106 CFU) of S. aureus was administered in the mice, the survival was not altered between wild-type and TLR2-deficient mice (data not shown). 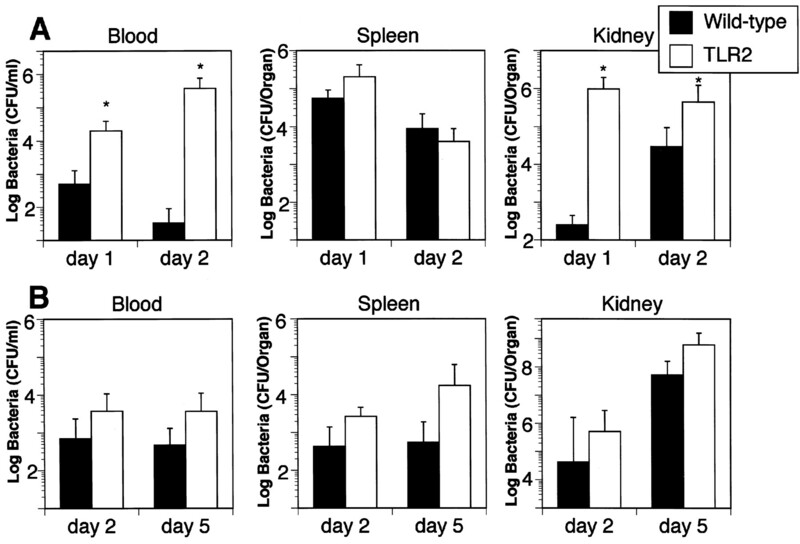 To investigate whether this susceptibility was the result of altered bacterial distribution and growth in vivo, the bacterial numbers in the blood, spleen, and kidney of mice were determined at 1 and 2 days after 1 × 107 CFU of S. aureus infection. At both 1 and 2 days, the number of S. aureus in the blood and kidney were higher in TLR2-deficient mice, consistent with high morbidity and mortality of TLR2-deficient mice after infection with S. aureus (Fig. 2⇓A). When the mice were inoculated with 1 × 106 CFU of S. aureus, a statistically significant difference was not observed in the bacterial numbers between wild-type and TLR2-deficient organs at both 2 and 5 days after inoculum (Fig. 2⇓B). Survival of TLR2-deficient mice (n = 10, ▪) and wild-type mice (n = 10, ○) after i.v. infection of 1 × 107 CFU of S. aureus. p < 0.03 in log rank test. Numbers of live S. aureus in TLR2-deficient and wild-type mice after injection of bacteria. TLR2-deficient mice (n = 4 or 5) and wild-type mice (n = 4 or 5) were infected i.v. with 1 × 107 CFU (A) or 1 × 106 CFU (B) S. aureus. The blood and organs were collected 1 and 2 days (A) or 2 and 5 days (B) after injection, and bacterial counts were determined by culture on agar. Data are represented as the mean number of CFU ± SD. ∗, p < 0.05 in Mann-Whitney U test. MyD88 is an adaptor molecule essential for the signaling of the IL-1R/TLR family. We have previously shown that MyD88-deficient mice lacked responsiveness to IL-1, IL-18, and LPS (19, 20). S. aureus PGN-induced TNF-α production was also abrogated in MyD88-deficient macrophages, indicating the role of MyD88 in anti-Gram-positive bacterial host defense (21). Therefore, we infected MyD88-deficient mice with S. aureus and monitored their survival. After inoculation with 1 × 107 S. aureus, all MyD88-deficient mice succumbed to infection and died within 5 days, whereas 80% of wild-type mice survived for 14 days (p < 0.0003,Fig. 3⇓). MyD88-deficient mice died more rapidly than TLR2-deficient mice. Next, the number of bacterial cells in the blood, spleen, and kidney were determined at 1 day of 1 × 107 CFU S. aureus infection. 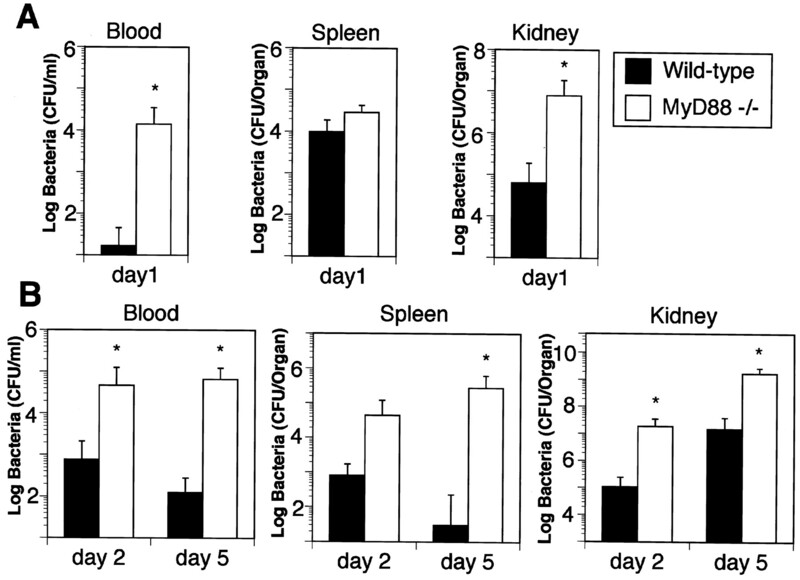 Bacterial numbers in the blood and kidney were increased in MyD88-deficient mice compared with wild-type mice (Fig. 4⇓A). Even when the mice were inoculated with a lower dose of bacteria (1 × 106 CFU), the bacterial numbers in the organs from MyD88-deficient mice were significantly higher than those from wild-type mice (Fig. 4⇓B). These results indicate that MyD88-deficient mice are more susceptible to S. aureus infection than TLR2-deficient mice. Survival of MyD88-deficient mice (n = 10, ○) and wild-type mice (n = 10, ▪) after i.v. infection of 1 × 107 CFU of S. aureus. p < 0.0003 in log rank test. Numbers of live S. aureus in MyD88-deficient and wild-type mice after injection of bacteria. 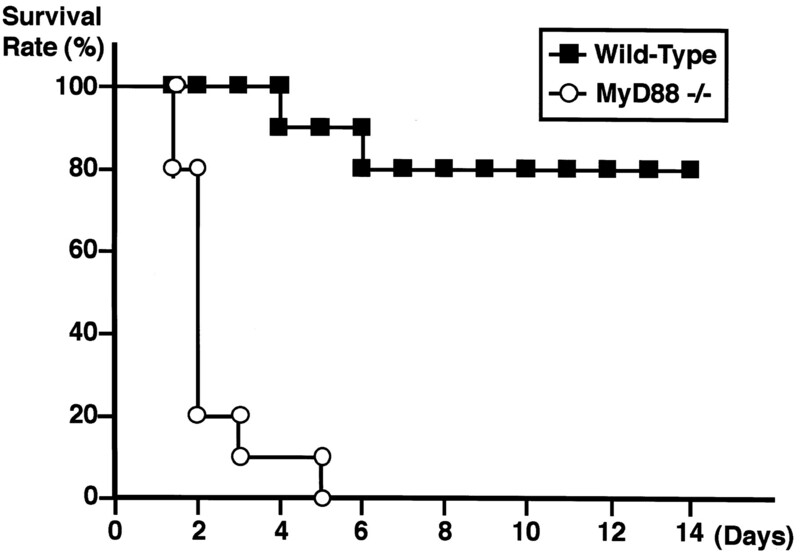 MyD88-deficient mice (n = 3 or 4) and wild-type mice (n = 3 or 4) were infected i.v. with 1 × 107 CFU (A) or 1 × 106 CFU (B) S. aureus. The blood and organs were collected 1 (A) or 2 days and 5 days (B) after injection, and bacterial counts were determined by culture on agar. Data are represented as the mean number of CFU ± SD. ∗, p < 0.05 in Mann-Whitney U test. Furthermore, we examined the responsiveness of peritoneal macrophages from wild-type, TLR2-, and MyD88-deficient mice to heat-killed S. aureus. Thioglycolate-elicited peritoneal macrophages were cultured in the presence of 1 × 107 CFU/ml of S. aureus for 24 h, and concentrations of TNF-α and IL-6 in culture supernatant were measured. Macrophages from wild-type and TLR4-deficient mice produced almost the same amount of TNF-α in response to heat-killed S. aureus. TLR2-deficient macrophages produced a reduced, but significant level of TNF-α. In contrast, MyD88-deficient macrophages did not produce any detectable TNF-α (Fig. 5⇓A). IL-6 production in response to S. aureus was also reduced in TLR2-deficient macrophages and abrogated in MyD88-deficient macrophages (Fig. 5⇓B). Production of TNF-α and IL-6 in response to heat-killed S. aureus in TLR2-, TLR4-, and MyD88-deficient macrophages. Peritoneal macrophages from wild-type, TLR2-, TLR4-, and MyD88-deficient mice were cultured in the presence of 1 × 107 CFU/ml of heat-killed S. aureus for 24 h. Concentrations of TNF-α (A) and IL-6 (B) in the culture supernatants were measured by ELISA. The results are representative of three independent experiments and are shown as the mean ± SEM of triplicate wells. ∗, p < 0.05 in Mann-Whitney U test. N.D., Not detected. The present study demonstrated the critical role of TLR2 and MyD88 against extracellular Gram-positive bacteria using knockout mice. Both TLR2- and MyD88-deficient mice developed higher mortality compared with wild-type mice after inoculation with S. aureus. These are associated with a bacterial growth in the blood and kidney. We have previously shown that S. aureus PGN-induced cytokine production was dependent on TLR2 (9). Thus, failure of recognizing invading bacteria is responsible for high susceptibility in TLR2-deficient mice. It was reported that C3H/HeJ mice, possessing a point mutation in the Tlr4 gene, are highly susceptible to infection with Salmonella typhimurium. LD50 value of the bacteria for C3H/HeJ mouse strain was <2, in contrast to the resistance of C3H/HeN mice to S. typhimurium infection (LD50 = 1 × 104) (22). These observations indicate the distinct roles of TLR2 and TLR4 in discriminating invading pathogens. MyD88-deficient mice were also highly susceptible to S. aureus infection and they were more susceptible to infection than TLR2-deficient mice. We have shown that MyD88-deficient mice display the defective response to many bacterial components and IL-1 family cytokines such as IL-1 and IL-18 (19). Both severely impaired bacterial recognition and failure of signaling mediated by IL-1 family cytokines may contribute to the susceptibility of MyD88-deficient mice to infection. We have previously shown that S. aureus cell wall-mediated TNF-α production was fully TLR2 dependent (9). Therefore, it was surprising that the production of proinflammatory cytokine was induced in response to heat-killed S. aureus in TLR2-deficient macrophages, although the level was reduced compared with that in wild-type macrophages. In contrast, bacteria-mediated TNF-α production was abrogated in MyD88-deficient cells. Although TLR4-deficient macrophages displayed impaired responsiveness to Gram-positive lipoteichoic acids, TLR4-deficient macrophages re-sponded to heat-killed S. aureus to the same extent as wild-type cells, indicating that lipoteichoic acid on S. aureus cell surfaces may not significantly contribute to cellular activations. These results suggest that S. aureus is recognized not only by TLR2, but also by other TLR/IL-1R family members except for TLR4. A previous report demonstrated that the treatment with anti-TNF-α Ab to mice after inoculation of S. aureus increased the death rate (23). Our results also indicate the correlation between the S. aureus-induced TNF-α production and the resistance of mice to the infection. Taken together, innate recognition of bacteria by TLR family members is quite important for eliminating invading bacteria. Particularly, TLR2 plays a crucial role in host defense against extracellular growing Gram-positive bacteria. Similarly, high mortality after S. aureus infection and complete abrogation of proinflammatory cytokine secretion in MyD88-deficient mice shows an essential role of MyD88 in resistance to Gram-positive bacterial infection. We thank Dr. Akio Nakane for providing S. aureus 834 strain, Dr. Yoshihumi Takeda for helpful suggestions, and Dr. Hiroko Tsutsui for providing mice. We thank T. Aoki for excellent secretarial assistance and N. Tsuji and E. Nakatani for excellent technical assistance. ↵1 This work was supported by grants from the Ministry of Education of Japan. ↵3 Abbreviations used in this paper: TLR, Toll-like receptor; PGN, peptidoglycan. Schwandner, R., Dziarski, R., Wesche, H., Rothe, M., and Kirschning, C. J. Peptidoglycan- and lipoteichoic acid-induced cell activation is mediated by Toll-like receptor 2. J. Biol. Chem. 274:17406.